Bullet Shot: Mike McKnight | The Gettysburgian. During his junior year season in 2017, Mike McKnight received All-Centennial Conference Honorable Mention. 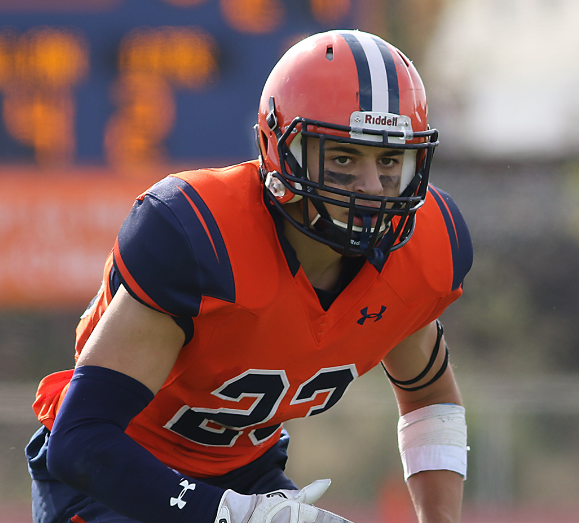 As a safety and cornerback for the season, he placed sixth in the league with 83 tackles and finished one pass break-up shy of Gettysburg College’s single-season mark. Now as a senior, McKnight is even more optimistic for 2018 season. McKnight was elected one of the captains under new head coach Kevin Burke. In a preseason interview with Corey Jewart on the Bullets website, McKnight expressed zero concerns for the new faces on the team. The Bullets have their season opener in Shirk Field at Musselman Stadium on Saturday, September 1 against Bridgewater College, their only nonconference game of the season. McKnight and the rest of the Bullets are up for the challenge and are looking forward to seeing how their new team will shape up for the rest of the season. “It’s a new team right now. We have a new head coach, new coaches all over the field, and new players. It’s exciting to be back on the field and playing in front of our fans,” said McKnight.